Douliana is a small traditional village, 22 km. east from Chania city, in an area of great natural beauty. 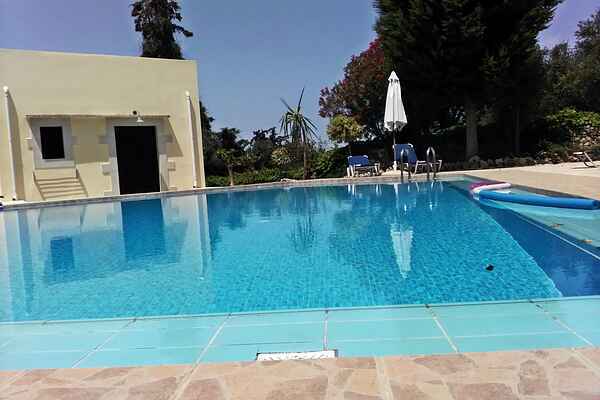 On the premises, are 5 Studios, (one large room with double balconies) and 3 houses (studio and one bedroom on top) with private terraces, arranged to provide privacy and calm, sharing a large pool with terraces overlooking a quiet country side and the open sea. All studios and houses are equipped with kitchen corner and bathroom and have air conditioning. TV,PC,printer are available in the common use room. Wi-Fi facilities. Sun bathing chairs for outside and parasols free of charge. Shared pool of 80 sqm, any time available. All studios have their own balconies and unrestricted view. Welcome basket offered at arrival! including Coffee, tea, milk, orange and toasts for breakfast. Pets allowed on request. Parking outside from property. From the property, a small road surrounded by forest, leads to the sea front at 3 km. The nearest beach KERA is at 2,5 km and the beaches of Almirida and Kalives are at 3 km, where you also find several supermarkets, kiosks, restaurants, bars, sporting activities center etc. Summer time , in most villages very close to beaches are many people, much traffic and lots of noise. So it is better to select a place not far from the sea front but not in the middle of high season turbulence.